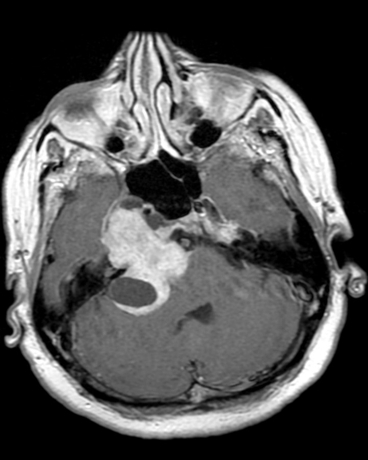 MRI, if you get this wrong … we need to talk! Give a detailed description of the abnormalities on this MRI image. What historical features would you elicit from the patient? the history required deals with symptoms relating to local compression - namely deafness, vertigo (CN VIII), diplopia (CNIII, CN IV, CN IV) and headache (CSF outflow compression). I would also sak about familial diseases such a von Recklinghausen's and a family history of schwannoma. What histological features would you expect to see in a resected specimen? What is the role of radiation therapy after incomplete resection? Radiotherapy should be reserved for circumstances where complete surgical debulking is not possible or achieved and tumour regrowth has occurred or would be disastrous. Describe how you would construct your treatment if surgery were deemed impossible. The GTV will be whatever enhancing tissue remains (it looks like the green outline now - yes, don't feel tempted to include the vein, it is not tumour! ); the CTV will not extend into the brain but will spread along the meningeal surfaces and into the bone and geniculate ganglion, how far is the question! ; the PTV is not drawn, it is an expansion on the CTV (we use a 3mm IGRT approach so I would expand by 3mm! ); I would also want to control dose to my optic apparatus (retinas, optic nerves, optic chiasm which I would outline and then expand by 3mm (same reason as before!) and then consider keeping the dose to 45Gy maximum in that area, lens would be kept to 8Gy, AND I would be using IMRT!